Take a writer. Take an established character. The run that results is going to reflect both of them, who the two of them have traditionally been. And then there are creative choices, where the writer chooses among possibilities. The Grant Morrison Batman of 2006 was not the Grant Morrison Batman of Arkham Asylum or Gothic and Morrison's Hal Jordan of 2009 is one out of maybe several choices he might have made. If it's a recipe, it's a stew, with lots of tasty things thrown in. So far, it's been a feast. Hal Jordan to some extent fits a template that Batman or Superman can fit but Animal Man cannot: He is an alpha character. Most superheroes seem super in the world of their own stories, but some of them are on a higher level. Superman at his best is the best and most famous and accomplished being in the history of the Universe. Batman at his best is unbeatable. Hal Jordan at his best is the most confident and capable hero who's ever wielded a power ring – the champion not just of his planet and time, but all planets and all times, capable of transcending fear and doubt in an absolute way. Other writers have weakened Hal, making him a troublemaker, hapless at love, a drifter who can't hold a steady job, the predictable stiff who can't be as interesting as John Stewart or Guy Gardner, and even a drunk driver and psychotic killer. Morrison can put Hal into heroic situations and ignore those weaknesses in his past, but instead, he's opening them up, acknowledging them, redeeming them. The heroic situations are many, to be sure, and provide pleasure after pleasure. It begins in #1 with Hal doing nothing but observe in amusement as the meganthrope destroys himself. Since then, he's gone on a tear of victory after victory. He doesn't fail, can't fail. He wins on the field of action, he enters every situation with unfailing confidence. Morrison is making Hal supreme in ways we've never seen before, superb as a detective, student of the cultures and civilizations of the 3600 space sectors, and even in the interrogation room. But we also see Hal moving past the ghosts of his past. He dismisses his career failures as unimportant. He isn't, as the 1960 formulation of Hal went, utterly without fear, but, as he tells Countess Beelzebeth, "you have to know fear to overcome it, own it. Turn it into something you can use." He has been possessed by a demon, and having moved past that, has no inner demons. Geoff Johns, in Green Lantern: Rebirth explained Hal's greatest failings away, made them not really his fault. Morrison goes further, redeeming Hal totally. It's not just that he's not to blame. He's even better now because of his earlier defeats. 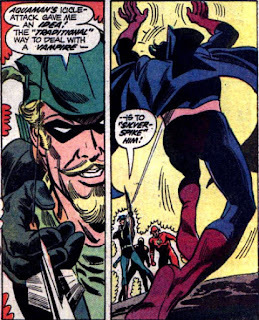 I missed posting single-issue responses, so I did not have time to dwell on, as I would have, the seeming anomalies along the way where Hal's rectitude was brought into question – most strikingly when we saw him execute a prisoner from Dhor at the end of #3. As we now know, this was part of a ruse, taking Hal's extremely-well-established trope of being in trouble with the Guardians and using it as a way for him to infiltrate the Blackstars. The haunting foreshadowing at the end of #1 about a traitor in the Green Lantern ranks turned out to be Hal, carrying out that ruse. Specfically, Morrison is creating one instance in which Hal, purportedly a traitor, is really acting from a position of good and within the system. Symbolically, Morrison is redeeming a history of bad behavior by Hal. He is a winner and none of the past charges stick. The triumphs, then, in The Green Lantern are absolute ones, and follow a time-tested formula of showing the hero besting not only his ordinary enemies, but even extraordinary ones, and surpassing his fellow heroes. Thus, when Earth is shrunken and stolen (one may recall that Metropolis was shrunken and stolen at a comparable moment in Morrison's Action run), Morrison took Hal's rescue to new (and blasphemous) heights, with Hal Jordan putting what looked like the Christian God under arrest – a (symbolic) superfeat for the ages. 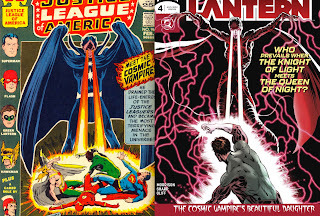 Less of an affront to a major world religion but perhaps more significant in Morrison's worldview, the same issue also shows Hal as triumphant in wrestling Earth from the false god while Earth's other top-tier superheroes (including Superman, Batman, Wonder Woman and – particularly relevant to the GL Corp – John Stewart) were helpless to save the planet. Then, as yet another token of Jordan's supremacy, we see him put the entire population of Earth under arrest (whatever that means). In a tie-in to our times, Morrison serves up social commentary by implying that the population of the world, bent by mind control to accept their capture, didn't rightly know what they were choosing and "drunk in charge of an planet… jeopardizing their own lives and future generations" needed to be set straight by Hal – there's a deliberate parable there for political events in recent years. While Hal is the single dominant figure in the story, the cast is not small. Tapping Hal's publication history, Morrison has gone broader than one might have imagined. Yes, Hal's up and down personal life (once represented by an unstable professional career, later leading to mass murder and death) has been mentioned, as well as other traits such as loose liaisons with romantic partners. And yes, we have seen quite an imaginative use of the vast GL Corps, freely borrowing from the imaginative output of earlier writers (Rot Lop Fan, the sightless, acoustic-based F-Sharp Bell created by Alan Moore) as well as offering some new GLs and twists on some old ones. But broader still, Morrison has drawn upon the sci-fi Silver Age as a whole, with villains from Dhor (introduced with Kanjar Ro in JLA #3). A particular emphasis has been paid to the legacy of Starbreaker, a JLA super-foe from JLA #96-98, a cosmic vampire who vastly outpowered Superman, Hal, and Barry before pausing to feast upon the Earth. Starbreaker's original cover art was used as the inspiration for Morrison's Mandrakk. (On a personal note, that story was a bit before my time, but I found the cover so cool that it was, I think, the very first older issue of a comic that I ever bought from a used comic store just because it looked interesting.) 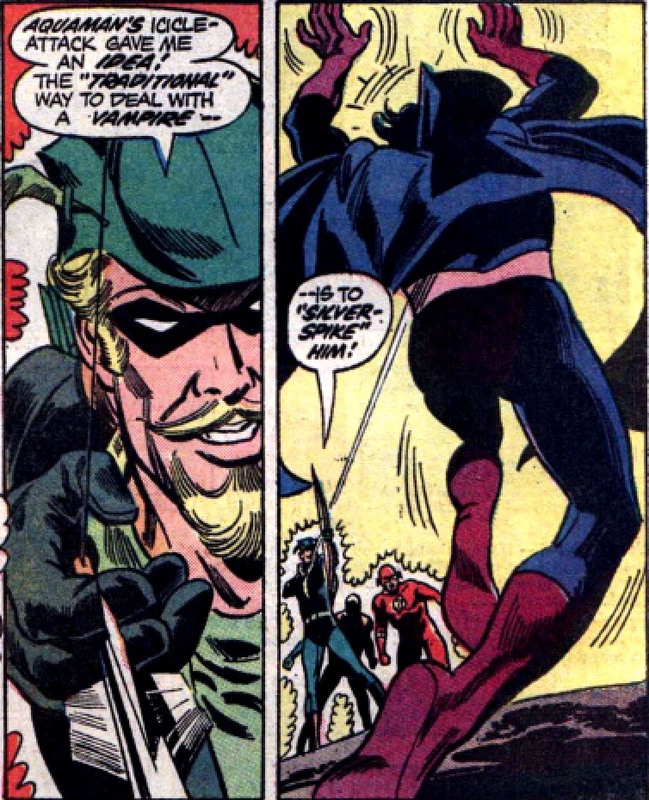 Here, Starbreaker's daughter, Countess Belzebeth (named for the Old Testament's Baalzebub with a feminine suffix tacked on) seeks revenge with a particularly bitter memory, Hal anticipates, for the way Green Arrow shot her father with a silver arrow in JLA #98. At the close of #5, we see Adam Strange, the latest example that, for all of the expanse of Green Lantern history to choose from, it's clear that Morrison has some favorites, with a lot of focus on characters from the 1959–1965 era from which Hal himself originated. Contributing some drama, and quite a bit of humor, sometimes in the same panel, Morrison has imbued this run with the superficial qualities of a trope-heavy TV cop show. Morrison's fine ear for dialogue has resulted in some hilarious uses of these clichés, perhaps best when the false God, threatened with arrest, tells Hal, "Thos shalt ne'er make thine acusation stick." It's probably not a coincidence, either, that Hal works with GL Tagort in issue #4, and a British TV cop from Morrison's own Glasgow was named Taggart. Morrison's Batman run was as pure an example as you could imagine of an extended story with one central villain behind it. While the Joker, the al-Ghuls, and some minor figures popped up from time to time, the great majority of Batman's troubles there were due to a massive plan emanating from Doctor Hurt. To different extents, some of his other runs have also built up to a pivotal encounter between his heroes and one, profoundly menacing villain, someone worthy of demonstrating the ability of any hero who could defeat them. In Morrison's run, Controller Mu is referenced at the end of the first issue. Mu is working on multiple threats at once. In order to construct the "ultimate asset," an ultimate will-powered weapon, requires obtaining five different components, of which a Luck Dial was second and Evil Star's starband the third. Component one was already in their grasp, an antimatter being that was apparently alive and formidable: They obtained it from a moth world, as seen in flashback in #4. It killed several pirates before they subdued it, then ambushed Green Lanterns Maxim Tox and Chriselon. 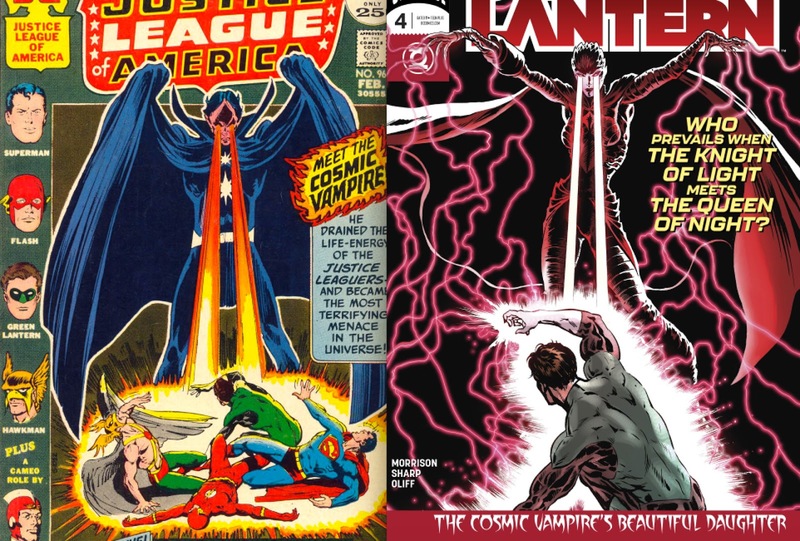 This is apparently what they vivisect for its heart at the end of issue #1, an Antimatter Lantern that curious resembles Hal. If they only have three of the five, we have to expect something big. Hal gave the Darkstars his ring, which seems likely to contribute, but since it was a ruse from the beginning, it is unlikely that he and the Guardians are knowingly (literally) handing them a victory. Either this ring is spiked somehow or they have a sure way to stop Controller Mu from getting/after getting the fifth component. Whatever that ultimate weapon is, it suggests Morrison's use of this idea in Final Crisis, realized into an ultimate wishing machine (itself originating in a Sixties LSH story). Will-powered weapons are one of the roots of superhero comics (and certainly, centuries of stories before that) and Morrison seems sure to make a grand use of this idea before the run is done. There's a point in superhero comics where the creators really have fun with the hero by putting them in multiple, unusual situations, showing the hero's flexibility. There might be a hundred stories where Superman or Batman were cast as some sort of wild variant on what they normally are – a pirate, a cowboy, a magician, a movie star. Return of Bruce Wayne encapsulated that into a single work. But while that's old hat for Superman and Batman, Morrison is doing something we haven't seen much of with Hal in that position, showing him not only as a tough cop (the focus of the series), but in quicker, temporary roles as a noir figure (undercover in #4) and in a wildly un-Green-Lantern-like goth scenario on the planet of the vampires. Seeing a couple of these makes it seem likely that we'll see more, and I couldn't pretend to guess which ways that will go. Pirate Hal? Cowboy Hal? Clearly, there's a design here for a story that will take a year or more to come around to where Morrison is planning. Hal ends #5 in a cliffhanger where he has to kill Adam Strange in order to continue his ruse. The teasers at the end of issue #1 are largely untapped, so there's a vast Multiversal storyline still ahead. We will see Controller Mu build his power and offer an ultimate challenge for Hal. There's a traitor within the Green Lantern ranks. And the free will of Hal vs. the authority of the Guardians remains a tension that could turn into something bigger. The Guardians have told Hal that if his undercover mission goes bad, they will disavow him. What could be a more ultimate challenge than to have the source of his powers revoked, and need to escape unjust persecution? A decade back, Geoff Johns wrote a Hal run of 75 issues (plus lots of extras) that was truly for the ages. Now his friend Grant Morrison is on a mission to write Hal a new, defining epic. If it remains self-contained – no big crossovers like Darkest Night – it may not capture fan attention on the level of a Batman or JLA run or Johns' GL, but it has begun as compelling and well-balanced as any of Morrison's earlier big runs. I'll be sitting back and enjoying. Could the symbol of the hydrogen atom present in the Book of Oa be a reference to Captain Atom of Earth 4, and connect to the upcoming multiversal storyline teased at the end of issue #1? That sounds like the right connection. I don't know how much Morrison is able to coordinate with Doomsday Clock, which has been slipping deadlines, but I think he'll indicate that Dr. Manhattan is the reason why the Book of Oa has been revised.